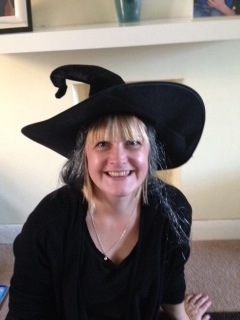 Today I’m delighted to welcome fellow Carina author, Kerry Barrett, to the blog. 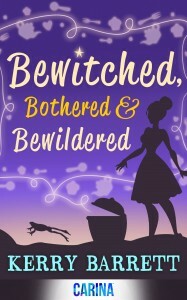 Kerry’s debut novel, ‘Bewitched, Bothered and Bewildered’ is released tomorrow for Halloween and I can’t wait to read it! The cover is fab and the story sounds right up my street! Kerry, it’s lovely to have you here today. Can you tell us a little bit about yourself, where you’re from, how long you’ve been writing and what you do when you’re not writing? I’m a mum of two small boys and I live in south London, though I was born in Edinburgh. I write for All About Soap magazine, so I spend a lot of time watching EastEnders and Emmerdale. I’ve been a journalist for about 15 years and writing for ‘myself’ almost as long, with varying degrees of success! When I’m not writing, I’m normally reading! Where did the idea for ‘Bewitched, Bothered and Bewildered’ come from? I’ve always wished I had a bit of magic in my fingertips to help with everyday irritations – a bit like Samantha in Bewitched. But then I started to wonder about what it would be like in reality to have to live your life normally, but have a bit of witchiness to control. It wouldn’t be easy! It took a loooong time! I started it back in 2005. Then I got married, made redundant, had two babies, and basically life got in the way. Eventually I finished it in 2011. I’m writing a sequel at the moment. I submitted to Carina on a whim and they initially said no, but then through a bit of serendipity, I ended up winning the competition for a novel to be released on Halloween. They contacted me on the day I was going on holiday to tell me I’d won, so lots of the initial excitement took place in the departure lounge at Gatwick airport! Do you think your background as journalist helps you in writing your fiction? Hmm, it does and it doesn’t. Obviously I’m quite confident in my basic abilities as a writer – I can string a sentence together, though creative writing is a very different kettle of fish! I’m also very good at working to deadlines. But I’m also very concise and find it hard to write to any sort of length – years spent summing up a week’s worth of Hollyoaks storylines in 400 words will do that to a girl! I’m writing the sequel to Bewitched, Bothered and Bewildered. Esme is in it, of course, but it’s more her cousin Harry’s story and is a bit of a murder mystery. Because I work full time and I’ve got two small children, writing is a bit of a luxury for me. I have to squeeze it into whatever free time I have – which is not much! I don’t write every day but I try to write as much as I can. I carry a notebook with me and I tend to scribble in it whenever the mood takes me – mostly on the train when I commute to work. I would love to be able to write full time. Aside from that, I am an unashamedly commercial writer and because of that I don’t dream of awards or accolades, instead I’d like to see my book being advertised on the platform at Charing Cross station! I walk past those posters every day and dream that one day my novel will be up on that wall. As a reader I have very eclectic tastes – I love crime novels, literary fiction, chick lit, historical fiction, horror – anything really! As a writer, Bewitched, Bothered and Bewildered and the sequel are romantic comedies with a paranormal twist. I’ve also written a ghost story that’s a bit different but still has that nod to the paranormal. Feeling Good – I love both the Nina Simone version and the Muse cover. Part-time witch, full-time glamorous high-flyer Esme Mcleod rubs shoulders with celebrities for a living, has a sort-of-boyfriend …and just enough magic in her fingertips to solve life’s little irritations; why shouldn’t she cast a little spell to catch the busy barman’s attention, or to summon a latte to aid her all-nighters? Called back to her small Scottish home town and meddling family, stiletto-clad Esme is way out of her comfort zone… But Esme must embrace her abilities as a witch, or watch her family lose their beloved café.